I know things are changing and we are all starting to grow apart, but I want you all to take the time to actually read this article carefully! You guys have always been here for me since day one, I know I can always count on you all when I am down and need to be picked back up! I don't honestly know how to thank you all for everything you have done for me! Throughout my life, I have had friends come and go, and they didn't support me as these guys do! They say you know when you find your people...I have defiantly found my people! You are the ones I call when I have good or bad news, the ones I call when I need advice! These four ladies are my rocks, the ones I call when I need to vent or just to even cry over the phone and they don't say anything, they just let me cry until I'm done then they speak! That right there is how I know I found my people! It never used to be the five of us, until we opened up our little circle and let the 4th person in! Then as time went on, we added the 5th person in, I am so so so thankful that we did! I have always been one to make new friends, but I will NEVER replace my best friends ever! You know how they say "you are stuck with me forever, you know too much about me?" well yeah that is definitely true in this case...so hang on tight ladies, you are in this for the long haul now! I can honestly say, I did not meet all of you in the same place at all! I have been best friends with one of you since I was like 7 years old, we met because you use to live down the street from me! Another one was, when I finally moved schools you were a grade ahead of me and had been best friends with someone else and that made us become closer and now here we are 8 years later best friends! My oh my next I have to admit, she is the girl that came into a circle of three and made it the four of us, she also the girl that lives three houses away from me we met because of how close she lives to me and we just instantly because best friends! Last but defiantly not least, the 5th and final person to enter this amazing group of people, she's the girl I met at the bowling alley through my cousin, I knew right then and there we were going to be best friends, I could just see it, we were practically the same person! I can honestly say, these four ladies deserve way more than I can physically give them, they deserve the world! So I just want to say thank you for being the most amazing group ever! Thank you for being so supportive, for never giving up on me, and always listening when I need someone! I love you so much, ladies! Some common phrases all roommates have said to each other at some point. 1. Do I have to go to class? 2. When do you have class today? 3. Want to get lunch before your next class? 4. Do you think I need to wash my hair? I can’t tell if it’s greasy. 5. What’s the weather? I don’t know what to wear. 6. Are you going out tonight? 7. What should I wear tonight? 8. Can I borrow a shirt? 9. We have to watch *insert Netflix show here*. 10. Want to order in dinner tonight? 11. We have to take a cute picture tonight so I can Instagram. 12. Is this a good caption for my Instagram? How’s the edit? 13. Ok I instagrammed … go like and comment. 14. We should probably clean our room soon. 17. I think it’s time to do our laundry. 18. 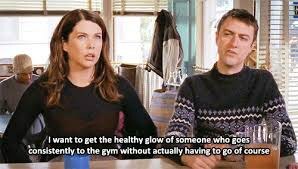 I’m going to start eating healthy and go to the gym more. 19. The dining hall menu is so bad today. 20. Thanks for being my best friend.